As of Star Wars fans weren't hyped up enough, LucasFilm has just released 2 teaser trailers for The Last Jedi official trailer, which drops on Monday during the halftime of the Monday Night Football game. Apparently, trailers teasing the official movie isn't enough these days, so we need teasers for the trailers. What's next? Teasers for the teaser? Regardless, Star Wars fans will take whatever they can get at this point, so 26-seconds is more than welcome, especially when it shows Luke's robotic hand reaching for his Lightsaber that Rey has brought back to him. 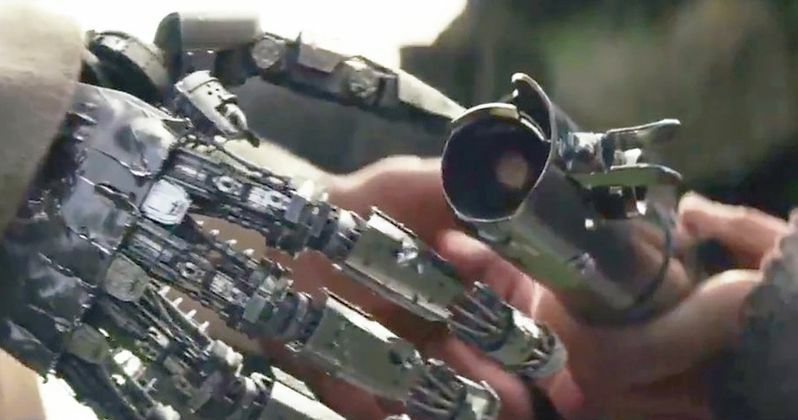 We've seen Luke's robotic hand teased out in the Empire Magazine spread from last month, so we all knew that this was coming at some point, but it's a pretty powerful image to see. Beyond that, we hear Luke saying, "Breathe, just breathe..." while an image of Rey's hands and lifting debris are seen, which is from the first trailer. Next, we see what appears to be Kylo Ren reaching for his Lightsaber with a menacing red background. Then, the powerful image of Rey returning Luke's Lightsaber to him comes and it's all over. It does exactly what it's supposed to do, which is leave every last one of us wanting more. The Last Jedi will pick up right where The Force Awakens left off with the young Rey returning the legendary Skywalker lightsaber to its rightful owner (who doesn't seem too pleased to see it). What's apparent is that Luke will not keep the lightsaber, presumably because he still has the green one he constructed ahead of Return of the Jedi. Plus, it might be a little traumatizing to see that Lightsaber again after all of these years, especially since it gave you the robotic hand in the first place. LucasFilm also released another teaser that features Rey training on Ahch-To, finally with a Lightsaber instead of her trademark staff that we've seen so much of in all of the promotional material leading up to now. It's a gradual progression that really looks like LucasFilm put a lot more effort into the promo material than previously thought. It's a given that they're going to treat a Star Wars project with the utmost respect, but it seems that marketing campaign has gone above and beyond anything that we've seen thus far. Right after the trailer's premiere, advance tickets will go on sale for The Last Jedi. Get ready for the sites where you normally purchase movie tickets to possibly crash shortly thereafter, that is unless the ticket retailers have taken some extra precautions this time around after learning from the past. Both of the teaser trailers came out at the same time as the Justice League trailer, which may have stolen some thunder from the Warner Bros. movie, which also has a huge hype surrounding it. Anyway, you can check out the second teaser trailer for The Last Jedi, courtesy of Good Morning America Twitter and the first teaser from LucasFilm below.